Our homes are our sanctuaries. Where we return after a day’s work, to eat and rest. Where we feel most safe. But for so many, our homes are places that present risk. For domestic workers – the nannies, cleaners and caregivers who do the work that makes all other work possible – our homes are their workplaces. Behind the closed doors of homes in our neighbourhoods are where this invisible workforce – consisting mostly of immigrant women – spend their days nurturing our children, cleaning our kitchens and caring for our grandparents and loved ones with disabilities. There are 100 million domestic workers, hidden from view by the outside world, excluded from many labour laws that protect other workers, and vulnerable in the shadows of the economy. 'Domestic workers speak: a global fight for rights and recognition' showcases the diversity and power of the domestic workers' rights movement. 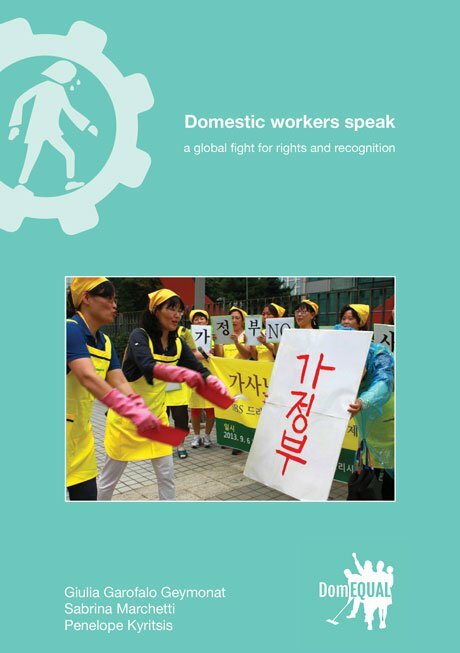 Featuring contributions from 23 worker-led groups, it details the struggle of domestic workers, explores their solidarity and methods of resistance, and calls for comprehensive rights for the world's most invisible workforce. If you listen to domestic workers you will hear stories that evoke every emotion, from humour to humiliation and heartbreak. Being forced to sleep in the basement near an overflowing sewage tank. Being withheld full pay, without any recourse. Being instructed to push a dog and a child around the neighbourhood in a double stroller. The pain of having to leave your own child to care for another. There are many positive stories as well, stories of interdependence and relationships that grow to become stronger than blood. But in the context of this very intimate field of work, every story includes vulnerability, and almost every domestic worker has a story of abuse. The cruel irony is that domestic workers are some of the most important workers in our economy. As the baby boom generation ages, enjoying longer average lifespans and preferring to age at home rather than in nursing homes or other institutions, the need for home-based elder care is growing. In addition, more women are in the workforce, meaning there is now less capacity for care at home and thus an unprecedented need for domestic services and support. Between the displacement of work in existing sectors of the economy by automation and artificial intelligence, and the increase in the need for home-based care and services, care jobs are anticipated to be the single largest occupation in the economy by 2030. The exclusion of domestic workers in the United States from basic labour protections, including the rights to organise, collectively bargain and form unions, is rooted in the legacy of slavery. In the 1930s, as cornerstone labour policies were being debated in the United States Congress, members from southern states refused to sign on if domestic workers and farm workers – who were mostly African American at the time – were included in the new protections. To appease them the National Labor Relations Act (1935) and several other key labour laws were passed with those explicit exclusions. With this as the legal and historical backdrop, I began organising with domestic workers in New York City some 20 years ago as part of an initiative to bring together Asian immigrant women in low-wage service work. It was impossible to ignore the quiet army of women of colour, mostly immigrants, pushing children of a different race in strollers up and down the streets of Manhattan. Inter-Alliance Dialogue Assembly with the National Domestic Worker Alliance. Jobs with Justice/Flickr. Creative Commons. Despite the need, it was a challenge to bring a small group of women together. Most women I met were primary income earners for their families and under extreme economic pressure to make ends meet, so the fear that coming to a meeting would jeopardise their jobs was a difficult barrier to overcome. The pressure on immigrant women was further compounded by the fear of being deported and separated from their families and communities. We persisted and eventually broke through, creating safe spaces for women to come together for connection, a sense of community and belonging. The workers who came found strength and power in one another. The word spread to workers in other cities who were also beginning to organise. Meeting by meeting, in circles large and small, domestic worker organising started to spread locally. By 2007 we were ready to break out of the isolation of local organising and connect nationally, holding our first national meeting and officially forming the National Domestic Workers Alliance (NDWA). 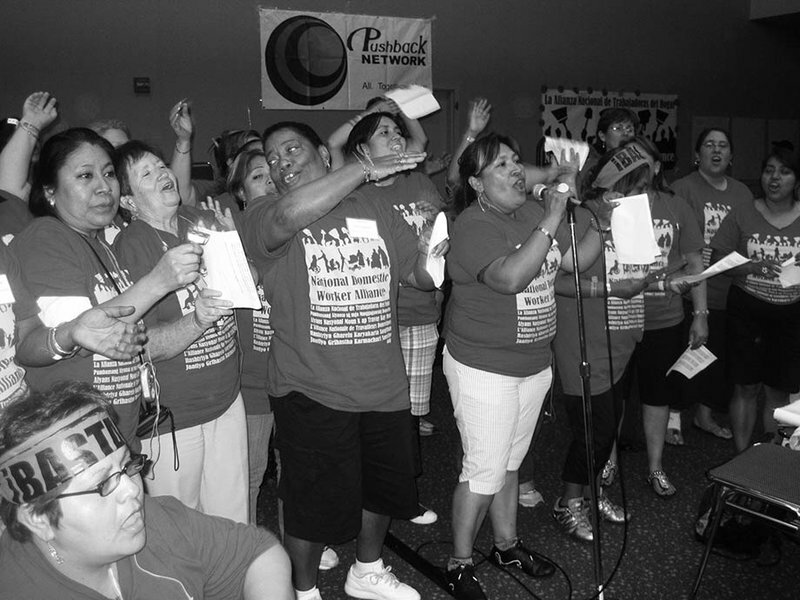 Ten years later, we’re an alliance of 64 local organisations of domestic workers in 36 cities and 17 states around the country. Our members are nannies, housecleaners, and caregivers for the elderly and people with disabilities who work in the home setting. The workers can join through a local affiliate organisation or as an individual from anywhere in the country, pay dues and gain access to training, benefits and other resources. Our newfound feelings of power became tangible as we filed lawsuits and organised rallies to hold abusive employers accountable. Lawsuits led us to understand the limitations of the law itself as domestic workers had been subjected to numerous exclusions in the labour law. It became clear that we would need to organise to change the laws and enact new policies altogether. Our feeling of power became tangible as we filed lawsuits and organised rallies to hold abusive employers accountable. We introduced the Domestic Workers Bill of Rights: state legislation that would establish basic protections for the workforce such as protection from discrimination, a day of rest per week, and paid time off. Our first big breakthrough came in 2010 when, after a seven-year campaign, the governor of New York state signed the bill into law. Since that time, six additional states have passed legislation to protect the rights of domestic workers, and the Federal Department of Labor has changed its rules to include two million home care workers previously excluded from federal minimum wage and overtime protections. In addition, groundbreaking work with domestic worker survivors of labour trafficking has begun to change the conversation about trafficking to include the spectrum of vulnerability that women in low-wage service occupations face. Millions of dollars of unpaid wages to domestic workers have been recovered and thousands of domestic workers have engaged in the campaigns, developing a whole new generation of leaders for social change movements. While our decade of work has focused on improving conditions for domestic workers, its significance to the rest of the workforce cannot be overstated. In the early years of organising, the conditions and vulnerability facing domestic workers felt marginal to the rest of the workforce. Today, these issues are affecting a much greater segment of people – lack of job security, lack of pathways to career advancement, and lack of access to social safety nets are issues faced by workers in many sectors. In fact, as more of the workforce becomes, temporary, part-time, or ‘self-employed’, the ‘non-traditional work’ dynamic has become more and more the norm. The future of work – for us all – can be seen in the experience of domestic workers. As the US economy adjusts to a growing ‘gig economy’, and as businesses and workers figure out how to leverage the benefits but avoid the dangers of tech-enabled gig-based work, we need only look to domestic workers to see how we will fare. Domestic workers are the original gig economy workers: we have experienced its dynamics, struggled with its challenges, and most importantly found some solutions to survive as a vulnerable workforce. We could all benefit, for example, from a new bill of rights for working people in the 21st century. There are millions of workers in non-traditional settings who are denied access to benefits, in addition to domestic workers. Every workforce could gain from reinvented training systems to bridge the growing divide between high-wage and low-wage workers. And, if we can figure out how to provide a real voice for this disaggregated workforce with a sustainable, scalable, 21st century workers’ organisation we could create the context for workers to sit at the table and help shape the future of the global economy once and for all. At the National Domestic Workers Alliance we are developing solutions with the future in mind. We are building a national, voluntary membership association that any domestic worker can join and gain access to training and benefits. We are developing new training curriculums and career pathways for the workforce, and making training accessible in various languages and on mobile phones. We’ve developed a Good Work Code – a framework for good jobs in the online economy – that helps companies design their businesses with the well being of workers in mind. And we’re developing a portable benefits programme that provides a means for independent contractors and informal sector workers to collect benefits contributions and apply them to the benefits she would like. As a workforce of mostly women, the way we develop solutions is critical. We must ensure that undocumented workers and migrant workers are fully included in our solutions and strategies. We must account for the legacies of slavery and colonialism that shape today’s workforce, as we invest in organising the workforce. Fortunately, that is precisely how our movement has evolved. At the intersection of many identities and experiences, we challenge ourselves to create organising models where everyone has a voice and dignity, where everyone belongs. The global domestic workers movement is rising at precisely the right moment, not only to bring dignity and respect to domestic work, but to shape the future of work globally to be one of opportunity and real economic security for all families. The domestic workforce sits at the centre of many changes in the global economy, and must also be at the centre of their solutions. Our belief is that the research, organising, and solutions that emerge from the global domestic workers movement hold the keys to many of the critical questions we must answer, to achieve dignity and opportunity in the future. So next time you see a worker quietly slip into a house with her cleaning supplies, or a nanny comforting a crying child who is not hers, or a caregiver gently pushing an elderly woman in a wheelchair into the sunshine, take note. They might go largely unnoticed by you, but their significance to us all cannot be overstated. Their struggles are the struggles of the future of work. Their solutions are the solutions for the future of work. They’re not just saving us from the domestic work conditions of the past and present, they just might also save us from a future of work that doesn’t learn from the mistakes of the past. And that is how we build a future of work with dignity and respect for all workers, a future of work we can all be proud of.